Elmhurst Art Museum presents a new art exhibit to that we at Elmhurst Toyota would like to recommend. 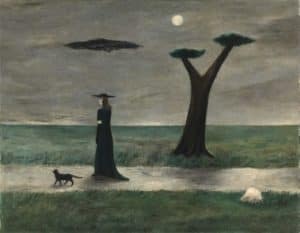 It’s called Gertrude Abercrombie: Portrait of the Artist as a Landscape. The show, which consists of 40 paintings, is available for the public to view from Jan. 20 to March 4. Abercrombie is a Chicago-based artist who is known for her surreal paintings, which have been called “psychic self-portraits.” The imagery in her work is based on her dreams and emotions. You’ll find dreamlike landscapes and interiors that refer to the artist’s inner world. Abercrombie uses imagery that incorporates natural objects and animals such as stones, sea shells, clouds, cats, eggs and lightning. While Abercrombie died in 1977, her otherworldly paintings are still as vital as the day they were created. Her work is included in the collections of institutions such as the Museum of Contemporary Art Chicago, the Art Institute of Chicago and the Smithsonian American Art Museum. The exhibit, Gertrude Abercrombie: Portrait of the Artist as a Landscape, features work from the collections of Elmhurst College, the Illinois State Museum and the private collection of Laura and Gary Maurer. Don’t miss this exceptional opportunity to look inside an artist’s mind. When you visit the exhibit, you’ll understand why we say the simple, minimalist style of the paintings are still fresh and vital today. The exhibition runs from Saturday, Jan. 20 through Sunday, March 4, 2018. Hours are Tuesday, Wednesday, Thursday, Saturday and Sunday: 11a.m. to 5 p.m. Friday hours are 11 a.m. to 7 p.m. Admission is $9 for adults and $8 for seniors. Museum members, students and anyone 18 or younger are admitted free. Admission is free to the public on the first Friday of every month.